Clove is the common name for a small, tropical evergreen tree, Syzygium aromaticum (syn. Eugenia aromaticum or Eugenia caryophyllata) and for its aromatic, dried, unopened flower buds, which are used as a spice. The term also is used simply as the name of the spice, and often in the plural as cloves. In another sense of the term, clove also can mean one section of a separable bulb, such as a clove of garlic. Cloves are one of the world's most important, popular, and useful plants. As a culinary spice, cloves impart a strong aroma and pungent taste that have enhanced the human enjoyment of many foods in cuisines all over the world. The essential oil is also valued for its use in flavorings and perfumes and its important antiseptic, analgesic, and anesthetic medicinal properties. Because of such values, cloves, originating from the Spice Islands (Maluku Islands), were central to the early spice trade, and remain quite prized today. The clove tree is in the Myrtle family Myrtaceae, a taxon of dicotyledon plants, placed within the order Myrtales. The family Myrtaceae has at least 3000 species distributed in 130-150 genera, including such well-known representatives as myrtle, guava, feijoa, allspice, and eucalyptus. All species are woody, with essential oils, and have flower parts in multiples of four or five. The flowers have a base number of five petals, though in several genera the petals are minute or absent. The stamens are usually very conspicuous, brightly colored and numerous. The leaves are evergreen, alternate to mostly opposite, simple, and usually with an entire (not toothed) margin. One notable character of the family is that the phloem is located on both sides of the xylem, not just outside as in most other plants. The clove tree, Syzygium aromaticum, is a conical evergreen that grows to a height ranging from ten to 20 meters, having large oval leaves and crimson flowers in numerous groups of terminal clusters. The flower buds are at first of a pale color and gradually become green, after which they develop into a reddish brown or bright red, when they are ready for collecting. Cloves are harvested when 1.5 to two centimeters (cm) long, and consist of a long calyx, terminating in four spreading sepals, and four unopened petals that form a small ball in the center. The flower buds are strongly aromatic and impart a flavor that can be described as hot and pungent. Cloves are believed to be native to the Maluku Islands (Moluccas), an archipelago in Indonesia historically known as the "Spice Islands." The name "clove" derives from French clou, a nail, as the buds vaguely resemble small irregular nails in shape. According to FAO, Indonesia produced almost 80 percent of the world's clove output in 2005 followed at a distance by Madagascar and Tanzania. Cloves are also grown in Pakistan, India, Sri Lanka and Mauritius, as well as the West Indies. The compound responsible for the clove's aroma is eugenol. It is the main component in the essential oil extracted from cloves, comprising 72 to 90 percent. Eugenol has pronounced antiseptic and anesthetic properties, and is used as a germicide and in mouthwashes. Other important constituents include essential oils acetyl eugenol, beta-caryophylline, and vanillin, as well as crategolic acid, tannins, gallotannic acid, methyl salicylate (painkiller), several sesquiterpenes, the flavanoids eugenin, kaempferol, rhamnetin, and eugenitin, and such triterpenoids as oleanolic acid, stigmasterol and campesterol. (Bensky et al. 2004). Cloves are used as a culinary spice for flavoring a variety of foods, while the essential oil (clove oil or oil of cloves) is used in flavorings (such as in medicines or synthetic vanilla), and in perfume. Cloves are used widely for perfuming the air and are an important incense material in Chinese and Japanese culture. They also are employed medicinally, including as a natural analgesic and antiseptic. Cloves can be used either whole or in a ground form for cooking and commonly flavor a variety of foods, from sweet to savory (Herbst 2001). They often are used as a flavoring for ketchup and sauces. However, cloves tend to be extremely strong and typically are used sparingly in cuisine. The spice is also smoked in a type of cigarette known as kretek in Indonesia. Cloves have historically been used in Indian cuisine (both North Indian and South Indian) as well as in Mexican cuisine, where it is often paired together with cumin and canela (cinnamon) (Dorenburg and Page 2003). In the north Indian cuisine, it is used in almost every sauce or side dish, mostly ground up along with other spices. They are also a key ingredient in tea along with green cardamoms. In the south Indian cuisine, it finds extensive use in the biryani dish (similar to the pilaf, but with the addition of local spice taste), and is normally added whole to enhance the presentation and flavor of the rice. Bud oil, derived from the flower-buds of S. aromaticum, consists of 60-90 percent eugenol, eugenyl acetate, caryophyllene, and other minor constituents. Leaf oil, derived from the leaves, consists of 82-88 percent eugenol with little or no eugenyl acetate, and minor constituents. Stem oil, derived from the twigs, consists of 90-95 percent eugenol, with other minor constituents. The main oil-producing countries are Madagascar and Indonesia (Lawless 1995). Oil of cloves is known best for its medicinal properties, having antiseptic, analgesic, and anesthetic properties. Many of these uses are detailed below under "medicinal uses." However, clove oil also is used in non-medicinal applications, such as for producing synthetic vanilla, as a flavor intensifier, and in perfumes. Clove oil also is used for anesthetizing and in higher doses euthanizing fish. It further has application in an all natural herbicide called "Perfectly Natural Weed & Grass Killer." The clove oil is the only active ingredient, and it is very effective at killing many types of plants. In addition, research has shown that clove oil is an effective mosquito repellent (Trongtokit et al. 2005). Clove oil is also used in oil painting. The anti-oxidant effects of the eugenol delays the drying (oxidation) of the drying oils (linseed, safflower, poppy, walnut) in the paint on the palette. A drop per paint "nut' is usually added. Alternatively, the palette can be covered, with a small amount of clove oil applied to the inside of the cover to allow the clove oil to disperse, preventing the paint from reacting with the oxygen within the cover. This method has the advantage of slowing the drying of the paints once they are applied to the painting. Oil of cloves is a natural analgesic and antiseptic used primarily in dentistry for its main ingredient eugenol. It can also be purchased in pharmacies over the counter, as a home remedy for dental pain relief, mainly toothache; it is also often found in the aromatherapy section of health food stores. The oil produced by cloves can be used in many things from flavoring medicine to remedies for bronchitis, the common cold, a cough, fever, sore throat and tending to infections. Oil of cloves is best known for its anesthetic properties. It is widely reported to be effective, and prior to the availability of safe, approved topical anesthetic drugs, was used by some dentists. Clove oil often is used to relieve pain caused by dry socket, a possible complication of tooth extraction. The antimicrobial and anti-fungal properties of clove oil allow its use for acne, warts, scars and parasites. The essential oil is used in aromatherapy when stimulation and warming is needed, especially for digestive problems. Topical application over the stomach or abdomen is said to warm the digestive tract. Cloves are used in Ayurveda and are called Lavang in India. Cloves are also used in Chinese medicine and in western herbalism and dentistry, where the essential oil is used as an anodyne (painkiller) for dental emergencies. Cloves are used as a carminative, to increase hydrochloric acid in the stomach, and to improve peristalsis. Cloves are also said to be a natural antihelmintic (expel parasitic worms) (Balch and Balch 2000). In Chinese medicine, cloves or ding xiang are considered acrid, warm, and aromatic, entering the kidney, spleen, and stomach meridians, and are notable in their ability to warm the middle, direct stomach qi downward, to treat hiccough and to fortify the kidney yang (Bensky et al. 2004). Because the herb is so warming, it is contraindicated in any persons with fire symptoms and according to classical sources should not be used for anything except cold from yang deficiency. As such it is used in formulas for impotence or clear vaginal discharge due to yang deficiency, for vomiting and diarrhea due to spleen and stomach coldness (identified with hypochlorhydria), and, together with ginseng and the herb patchouli, for morning sickness (Bensky et al. 2004). In West Africa, the Yorubas use cloves infused in water as a treatment for stomach upsets, vomiting, and diarrhea. The infusion is called Ogun Jedi-jedi. Oil of cloves is considered safe in very small quantities (less than 1500 parts per million) as a food additive (Bruneton 1995). However, clove oil is toxic to human cells (Prashar et al. 2006). If ingested in sufficient quantity or injected, it has been shown to cause life-threatening complications, including Acute Respiratory Distress Syndrome, Fulminant Hepatic (Liver) Failure, and Central Nervous System Depression; the lethal oral dose is 3.752 g per kg body weight (PTCL 2005; Hartnoll et al. 1993; Brown et al. 1992; Lane et al. 1991; Kirsch et al. 1990). The internal use of the essential oil should be restricted to three drops per day for an adult as excessive use can cause severe kidney damage. Large amounts of cloves should be avoided in pregnancy. Cloves can be irritating to the gastrointestinal tract, and should be avoided by people with gastric ulcers, colitis, or irritable bowel syndrome. In overdoses, cloves can cause vomiting, nausea, diarrhea, and upper gastrointestinal hemorrhage. Severe cases can lead to changes in liver function, dyspnea, loss of consciousness, hallucination, and even death (Bensky et al. 2004). 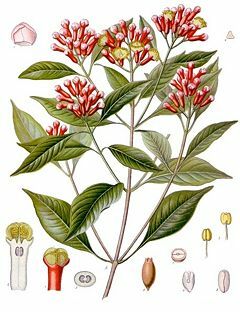 Until modern times, cloves grew only on a few islands in the Maluku Islands (historically called the Spice Islands), including Bacan, Makian, Moti, Ternate, and Tidore (Turner 2004). Nevertheless, they found their way west to the Middle East and Europe well before the first century C.E. Archaeologists found cloves within a ceramic vessel in Syria along with evidence dating the find to within a few years of 1721 B.C.E. (Turner 2004). Cloves, along with nutmeg and pepper, were highly prized in Roman times, and Pliny the Elder once famously complained that "there is no year in which India does not drain the Roman Empire of fifty million sesterces." 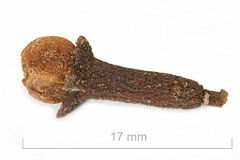 Cloves were traded by Arabs during the Middle Ages in the profitable Indian Ocean trade. In the late fifteenth century, Portugal took over the Indian Ocean trade, including cloves, due to the Treaty of Tordesillas with Spain and a separate treaty with the sultan of Ternate. The Portuguese brought large quantities of cloves to Europe, mainly from the Maluku Islands. Clove was then one of the most valuable spices. The trade later became dominated by the Dutch in the seventeenth century. During the monopoly of both the Portuguese and the Dutch, these nations strove to tightly control the production and trade. With great difficulty, the French succeeded in introducing the clove tree into Mauritius in the year 1770; subsequently their cultivation was introduced into Guiana, Brazil, most of the West Indies, and Zanzibar, which exports more cloves than any other country. Today, according to the Food and Agriculture Organization (FAO), Indonesia produces most of the cloves, with almost 80 percent of the world's clove output in 2005, but with most of that consumed internally. The clove has become a commercial success, with products including clove drops being released and enjoyed by die-hard clove fans. Balch, P., and J. Balch. 2000. Prescription for Nutritional Healing, 3rd ed. Garden City Park, N.Y.: Avery. ISBN 1583330771. Bensky, D., S. Clavey, and E. Stöger. 2004. Chinese Herbal Medicine: Materia Medica. Seattle, WA: Eastland Press. ISBN 0939616424. Brown, S. A., J. Biggerstaff, and G. F. Savidge. 1992. Disseminated intravascular coagulation and hepatocellular necrosis due to clove oil. Blood Coagul Fibrinolysis 3(5): 665-668. Bruneton, J. 1995. Pharmacognosy, Phytochemistry, Medicinal Plants. Hampshire, U.K.: Intercept Ltd. ISBN 1898298130. Dorenburg, A., and K. Page. 2003. The New American Chef: Cooking with the Best Flavors and Techniques from Around the World. John Wiley and Sons. ISBN 0471363448. Hartnoll, G., D. Moore, and D. Douek. 1993. Near fatal ingestion of oil of cloves. Arch Dis Child 69(3): 392-393. Kirsch, C. M., et al. 1990. Non-cardiogenic pulmonary edema due to the intravenous administration of clove oil. Thorax 45(3): 235-236. Lane, B. W., M. H. Ellenhorn, T. V. Hulbert, and M. McCarron. 1991. Clove oil ingestion in an infant. Human Exp Toxicol 10(4): 291-294. Lawless, J. 1995. The Illustrated Encyclopedia of Essential Oils. Rockport, MA: Element. ISBN 1852306610. Physical and Theoretical Chemistry Laboratory at Oxford (PTCL). 2005. Safety data for clove oil Physical and Theoretical Chemistry Laboratory at Oxford. Retrieved April 6, 2008. Prashar, A., I. C. Locke, and C. S. Evans. 2006. Cytotoxicity of clove (Syzygium aromaticum) oil and its major components to human skin cells. Cell Prolif. 39: 241-248. Trongtokit, Y., Y. Rongsriyan, N. Komalamisra, and L. Apiwathnasom. 2005. Comparative repellency of 38 essential oils against mosquito bites Phytother Res. 19(4):303-9. Retrieved April 30, 2008. Turner, J. 2004. Spice: The History of a Temptation. Vintage Books. ISBN 0375707050. This page was last modified on 10 September 2008, at 01:23.